The Hotel Le Clos Saint Martin is located in the heart of the Loire Valley, in Sancerre. It is a 3 stars Hotel of high standing, modern and confortable. The Hotel was entirely renovated in 2008, to give it the best of the modern amenities, but keeping its style and charm intact. The Hotel style is inspired from the 19th French Napoleonian style and has the spirit of the country houses of this region. High ceilings, mouldings and statues are the testimony of the classical style of the Hotel, whereas the interior courtyard, which is under glass roof, brings light et modern design to the whole. Classical and modern style combine in an elegant way. This audacious association gives birth to a warm and friendly atmosphere, where one will love to come to discover the Loire Valley. The Hotel is opened all day long. Il closes its doors from 11:30 p.m to 6:30 a.m. There is a night access with a code. A night watchman is present. Needing information, advice ? We're listening to you. The Hotel is air conditioned. All the rooms have individual air conditioners. A luggage service is at your disposal at the reception. You can leave your luggage here to visit Sancerre. The wifi is free in all the hotel. We accept American Express, Carte Bleue Euro, Master Card and Visa Cards. There is a wine shop inside the Hotel with a selection of wines from Saget La Perrière at the same prices as those of the winery’s own boutique. Open from 7.30 a.m to 11 p.m.
220V. Plug in for euro-american shavers. To begin a good day, what is better than a good breakfast ? An all-you-can-eat buffet is available in the big living room : tea, coffee, juices, viennese pastries, fruit salad, eggs, jam, honey and local food in a nice setting. The Hotel is an ideal place for staying with your family. In the middle of the countryside, in a serene atmosphere, you will rest ideally with your children and family at the Hotel Le Clos Saint-Martin. Pets are our friends. They are very welcomed in the Hotel. You just need to warn us of their presence at the moment of your reservation. In a charming and convivial setting, come and relax tasting the wines of the Saget Family. 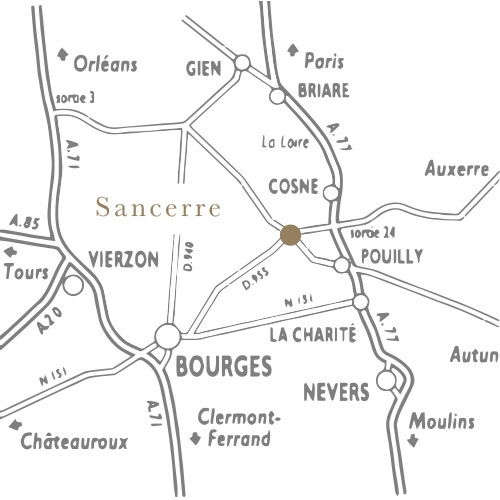 Sancerre, Pouilly-Fumé and other appellations of the Loire Valley are available.